Good Morning Auroville is a book too. With different pictures, essays, reportages and content. Something to take in your hand or give to the hands of others. Other than this website it is in GERMAN language. But you can flip through some bookpages here too, if you scroll down this page. The book "Good Morning Auroville" is published by Edition Bildperlen and is in German Language. It contains 192 pages with photos, interviews and texts on Auroville and is not meant to explain the "City Of Dawn" nor to romantizise it. Much more it is a multi-layered portrait of this unique experimental town in a southindian forest to leave you puzzled as Auroville does too. The content of the book is much different from this website, they both are meant to work on different levels. This website is more multimedia-orientated. The book gives a haptic pleasure. You can buy the book at AMAZON.DE , AMAZON.COM or from the publisher Edition Bildperlen. >> The roads were a labyrinth of complicated unlabeled paths and dead ends. Eventually we hit a giant, Buckminster Fuller–esque golden dome that sprouted from the ground. As being mainly a photobook, most of the pages naturally show pictures. Of architecture, red dust roads, portraits and the life in Auroville. I´ve chosen many different pictures from those on this website as both media are meant to add to each other. Here you´ll find a podcast made by Ben Hammer with me on the making of the book (in German language). 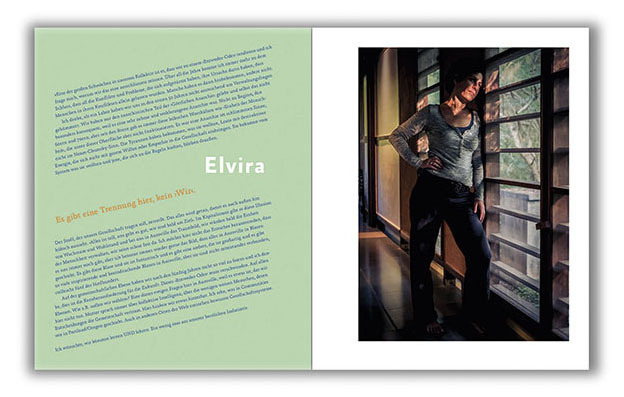 One essential element of the book are the combinations of portraits and interviews. On this website you can hear the complete interviews, in the book there are excerpts that deal with different aspects of Auroville and the life of it´s citizens.